If you give your self to love, then expect not only happiness, but the creases and problems along the way. That's exactly what Naomi Watts as Melissa and Matt Dillon as Richie have been going trough as they struggle to maintain their relationship. On the other hand, we see Norman Reedus play Norman, who is still hoping to get back together with Melissa to reclaim the love they once lost. What is comforting about this -- but not entirely related -- is my The Walking Dead fix has been temporarily satiated, seeing the actor for Daryl Dixon play a different role. I so miss The Walking Dead and I cant wait for its release on October 13, 2013. Watch the new trailer of Sunlight Jr., starring Naomi Watts, Matt Dillon and Norman Reedus. 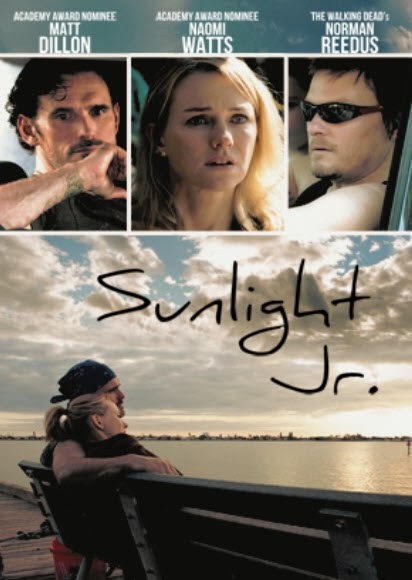 Sunlight Jr. spotlights hard-working convenience store clerk Melissa (Naomi Watts) and her disabled boyfriend, Richie (Matt Dillon), who are trapped in a generational cycle of poverty. Their luck may be changing when they learn that Melissa has become pregnant. But as soon as she loses her job and they get evicted from the motel they live in, their joy vanishes. Through this adversity, the couple realizes that they can never lose everything as long as they have each other. The movie was written and directed by Laurie Collyer. Joining Naomi Watts, Matt Dillon and Norman Reedus are William Haze, Tess Harper, Antoni Corone, Vivian Fleming-Alvarez, Keith Hudson, Victoria Vodar and Rachael Thompson. Sunlight Jr. is a drama movie that premiered on April 20, 2013 at Tribeca and will hit international theaters sometime in November 2013.